I spend a lot of time in Houston, everyone has a BBQ joint they swear is the best. I have had dozens and this is the only one I have ever chosen to review for publication on Live And Let’s Fly. It’s the best brisket in the world. That’s not hyperbole. 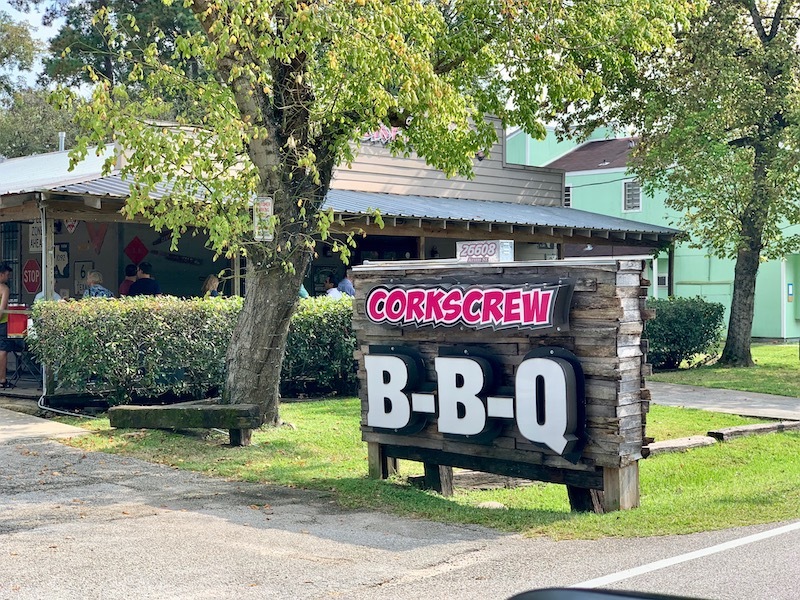 Corkscrew BBQ is tucked back from the main streets in old Spring, TX. This little community of shops and restaurants occupies older buildings and converted homes, it’s filled with boutiques that range from custom spice vendors to gun shops and the famous, Corkscrew BBQ. Free parking is available in front of the yard (to the left of the image below) and in a private lot behind the building. Like any good BBQ joint anywhere in the world, they close for the day when the BBQ runs out. As such, the line to get inside forms well before their open time Tuesday through Saturday of 11 AM Central. On the day we arrived, a car was waiting prior to our arrival and we were there more than an hour in advance. We walked around the shops for another 45 minutes or so before returning and came back to find ourselves 26th in line. Conveniently, they have a line with colored placeholders so you can feel free to walk around while you wait to order. The line remained 20-30 people strong even after the restaurant opened. Here is a link to their menu Corkscrew BBQ Menu. If you want to choose from the full menu, you’ll have to be there at open or before. They close when they run out of food (I assume smoked meats and not the sides) which usually happens between 3-5 pm Tuesday through Friday and a little earlier on Saturdays. We ordered a catering portion because we wanted to try everything. One thing we would have done between the three of us in retrospect was order less quantity, especially in the case of the sides. The problem was that we just didn’t know what the three of us would like and we’re not going to go back to through the line because we short ordered something. The moist brisket (top left of the above image) was the best any of us have ever had – all of whom are BBQ aficionados. Ribs (top right) were well cooked and a favorite by everyone at the table. The smoked turkey (bottom right) was serviceable, but when compared to the ribs or brisket, went mostly untouched. I had big hopes for their Fresh Made Link (beef/pork mix sausage) and was terribly disappointed. The sausage was dry and grainy, it’s not their best effort. Then we get to the sides. Why is this the first time that I have ever found mashed potato salad? Same flavors from the cold dish, excellent texture of mashed potatoes. We also ordered Baked Beans (sweet with a spicy kick) and macaroni and cheese. It should have been pictured, it wasn’t – I’m sorry, I was distracted. The barbeque sauce is made in house from scratch and sweet. Every BBQ spot has their specialty and the moist brisket is perfect at Corkscrew BBQ and while there were a couple of items I wouldn’t order upon my return, they aren’t a one trick pony. Corkscrew has amazing service. Employee after employee came by to offer us drink refills, ask how we liked the food, even collect our finished plates and bring boxes. They do not have waitstaff, some were management, bussers, or even some cashiers and kitchen staff. Everyone seemed to be excited that they work at Corkscrew and want to give us a great impression. It worked. If you’re in Houston, give Corkscrew a try, you won’t regret it. You picked a good place. Corkscrew is on the Texas Monthly Top 50 list. I’m trying to hit all 50 but haven’t been to any of the Houston-area joints yet. FYI, I usually find ~1-ish the “sweet spot” for visiting popular BBQ joints. You miss the lines, but it’s early enough that they aren’t sold out. What you experienced is nothing, by the way. Franklin’s in Austin is (in)famous for 2+ hour waits where they run out of stuff while you’re still stuck in line. If you ever make it to DFW, try Lockhart Smokehouse, also on the Top 50 list. Just as good but never more than a 10-minute wait, at least at the Plano location. This was my favorite post on this blog not written by Matthew. I love your restaurant reviews quite a lot! BBQ always makes me hungry, this sounds so delicious!!! Those aren’t beef ribs in the picture; they’re pork side ribs. Good option, but certainly not the top in the greater Houston area.